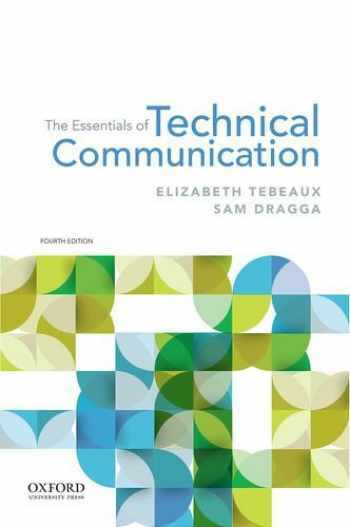 Acknowledged author Elizabeth Tebeaux wrote The Essentials of Technical Communication comprising 432 pages back in 2017. Textbook and etextbook are published under ISBN 0190856149 and 9780190856144. Since then The Essentials of Technical Communication textbook received total rating of 3.5 stars and was available to sell back to BooksRun online for the top buyback price of $19.34 or rent at the marketplace. In today's complex workplace, no one wants to read what you write. The Essentials of Technical Communication, Fourth Edition, was developed with this principle in mind. The respected author team continues to provide students with accessible and comprehensive instructions for planning, drafting, and revising technical documents that are clear and concise.Visit the book's free, open-access Companion Website at www.oup.com/us/tebeaux for additional student and instructor resources.